Ella Mai performs in the Union Ballroom on Oct. 18 2018. The concert sold out in 35 hours. 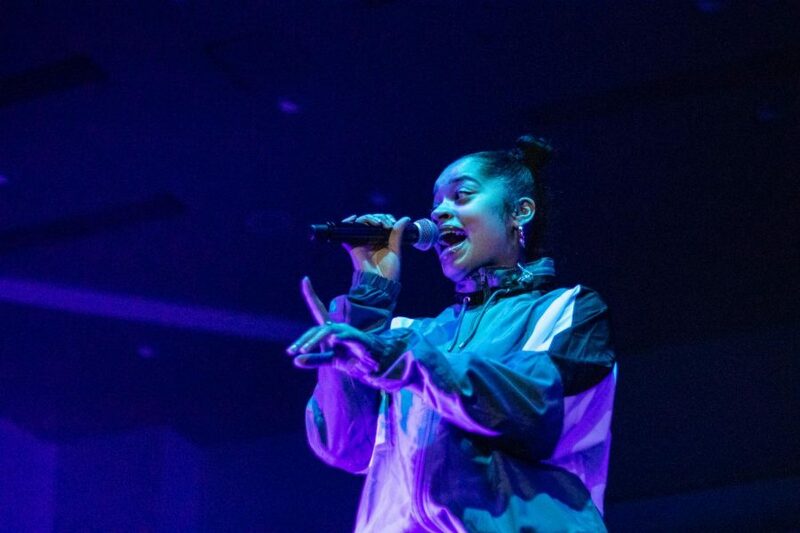 Popular British R&B artist Ella Mai performed to a sold out crowd in the University Union Ballroom at Sacramento State Thursday evening in UNIQUE Programs biggest concert of the semester. Tickets to the show sold out in 35 hours, according to UNIQUE. The crowd started lining up hours before the event, ready to see Mai, 23, sing some of her biggest hits in her young career. Criminal justice major Savana Pangelinan knew of Mai before she gained a lot of recognition. After finding out Mai was coming to Sac State, Pangelinan was eager to get tickets. “When I heard Ella Mai was coming, I was like, ‘So where do I get tickets?’ ‘How do I get front row?’ ‘Are there VIP passes?’ ” Pangelinan said. Mai saw her 2017 single stay on the Billboard Top 100 list for 28 weeks and peak at No. 5, according to Billboard Charts. Her single blew up on Twitter and had people ‘Boo’d Up’ to her song. After two opening acts, Kyle Dion and Mona V, the crowd chanted “Ella, Ella, Ella,” before she appeared on stage. “Anymore” was the first song she performed. The audience sang every single world right along with her. During her performance “Don’t Want You,” she confirmed that the song was a true story. Criminal justice major Bianca Morales said Mai gives off a positive energy, because she makes music to uplift her listeners. “She speaks to me positively, because she’s always talking about growth and woman empowerment,” Morales said. Mai performed the song “Trip,” one of the most popular songs on her new album, twice for the audience. “I thought [the concert] was really good. Her music, it tells a lot of her experiences with relationships, her feelings,” McKinney said. She talked to the audience as if she was having a conversation, even hinting at an upcoming tour. “I have an announcement coming next week, but because I’m here, I’m going to tell you first — Sacramento is the first stop on my Ella Mai tour,” Mai said. Mai appeared on stage around 9:00 p.m. and exited around 9:30 p.m.